Because of the sensitive nature of mental health and substance use issues, law students, attorneys, or judges who need help—or want to assist someone else who might need help—are often reluctant to seek assistance. Recognizing this concern, and in order to foster early and confidential contact, the Indiana Supreme Court authorized the creation of JLAP with the passage of Rule 31 of the Indiana Rules on Admission to the Bar and Discipline of Attorneys. All contact with JLAP is confidential under Admission and Discipline Rule 31 §9 and Rules of Professional Conduct 8.3 (c). Research has shown that lawyers may suffer from substance use disorder and depression at a rate higher than the general population. Experience has shown that lawyers may be more reluctant than others to seek help for their own problems. The purpose of JLAP is to provide confidential assistance to judges, lawyers, and law students who may encounter these and other issues that could interfere with their ability to practice in a professional and competent manner. This website is intended to provide members of the bar and bench with preliminary information about substance use, mental health, and other issues that can interfere with the practice of law. If you think you might have a problem, are concerned about someone else, or want to become a JLAP volunteer, please explore this website, read about JLAP's obligation to confidentiality, and then contact JLAP for further assistance or information. JLAP offers help to judges, attorneys, and law students who are experiencing life stressors, mental health or substance use issues, or any other issue which may affect their quality of life or ability topractice law. Help varies with an individual's needs or a particular case, but ranges from information and referral to one on one or group support to assistance with organization of an intervention. In addition, JLAP provides education to the bench and bar on relevant issues. The creation of JLAP in October 1997 merged two premier volunteer organizations—the Indiana State Bar Association's Lawyers Assistance Committee and the Judicial Assistance Team, an Indiana Supreme Court Pilot Program coordinated through the Judicial Center. Dedicated volunteers—both recovering and non-recovering—provide the crucial statewide network of peer support that enables JLAP to effectively deliver services to judges, attorneys and law students in need throughout Indiana. Volunteer opportunities also exist in a variety of areas in addition to peer support. For historical information about JLAP, please visit the Supreme Court's webpage with links to annual reports. For more information about Lawyer Assistance Programs, please visit the ABA Commission on Lawyer Assistance Programs (COLAP) website. Problematic alcohol use. According to the Substance Abuse and Mental Health Services Administration (SAMHSA) an estimated 7% of the general population age 12 and older met criteria for alcohol use disorder in 2014. Attorneys have long been considered to be more susceptible, but there was little empirical evidence. The American Bar Association and the Hazelden Betty Ford Foundation recently surveyed almost 13,000 attorneys in 19 states and found that attorneys suffer from problematic drinking at an alarming rate. Approximately 21% of the attorneys who completed the survey instruments scored consistent with problematic drinking that is hazardous, harmful, or otherwise generally consistent with alcohol use disorder. For lawyers under age 30 or in practice less than 10 years, the rate of problem drinking rises to almost 1 in 3. With approximately 18,500 licensed Indiana Attorneys, that could translate to over 3800 Indiana attorneys struggling with alcohol use that may adversely impact their lives. Depression. Attorneys also have a higher incidence of psychological impairment and a higher suicide rate than the general public. In 2014, approximately 6.6% of adults age 18 or older had at least one episode of major depression, while the ABA/HBF study found that approximately 1 in 5 attorneys surveyed met criteria for mild or moderate depression. Approximately 45% self-reported experiencing depression at some point in their career, and 11.5% reported suicidal thoughts during their career. Help is available. In spite of the high rates of problem drinking and depression, relatively few attorneys reported seeking help. 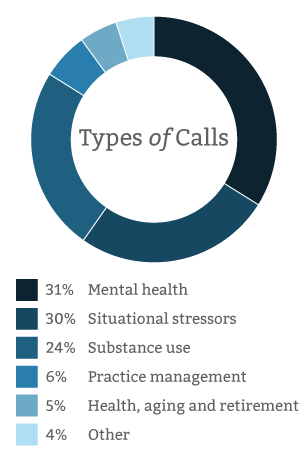 The most commonly cited barriers to seeking help were concerns regarding stigma and confidentiality. Any contact with JLAP is strictly confidential under Admission and Discipline Rule 31 and Professional Conduct Rule 8.3. Although JLAP is a Supreme Court agency, our office is located in a separate building to further protect confidentiality. We provide information, referrals, and individual and group support at no charge for judges, lawyers, law students, and bar applicants. If you are struggling or know someone who is struggling, please call JLAP at 866-428-5527. Your call is confidential and our services are free.